One of the best fighters ever built, the Grumman F-14 was born when the General Dynamics F-111B (for which Grumman was prime contractor) failed to meet the U.S. Navy requirement for a long range carrier-based interceptor aircraft. But to understand why the Tomcat was developed, it is necessary to explain why the F-111B was conceived and why missed to meet the service requirement. In the 1960s the then Secretary of Defense Robert McNamara decided that a multi-role, combat aircraft would have been jointly developed by both the U.S. Air Force (USAF) and the U.S. Navy. The following program was called Tactical Fighter Experimental (TFX) and was aimed to satisfy the requirements of the two services with two variants of the variable swing wing General Dynamics F-111. The F-111A was a land based low-level bomber for the USAF, while the F-111B was an interceptor armed with six AIM-54A Phoenix missiles for the U.S. Navy. The first flight of the F-111B occurred on May 18, 1966 and immediately there were problems – the major one being weight. The Navy had estimated the F-111B’s desired weight to be around the 60,000 pound mark; the weight of the F-111B was in excess of 70,000 pounds. Pilots also complained lack of visibility during the carrier approach due to the angle of attack and the reflection caused by the angle of the windshield. Furthermore the F-111B was so underpowered that it couldn’t generate the specified acceleration in military power on approach to the ship. McNamara decided to be informed about the shortcomings of the machine, and called together all the top executives of the companies involved for twice monthly meetings. Among the Navy representatives there was Vice-Admiral Tom Connolly who had realized that the F-111B should have been cancelled, at least as much the Secretary of Defense didn’t since continued to push on with the project. To better understand the problems of the aircraft, Connolly went to Forth Worth and flew the F-111B with an Air Force pilot and agreed that while the F-111A was a perfect bomber for the USAF, the F-111B could never be a fighter and it could not operate off an aircraft carrier. At this point also admiral Tom Moorer, who was the Chief of Naval Operations began to push for the cancellation of the program; moreover from a comparison study between the F-14 (then Grumman’s concept of a new fighter), the F-111B and a couple of other aircraft, resulted that the F-14 was a far better aircraft that any of the others. But still Secretary of Defense McNamara pushed for the F-111B. That, to all intents and purposes, was the end of the F-111B, and also the end of Tom Connolly’s hopes of promotion to four-star Admiral! 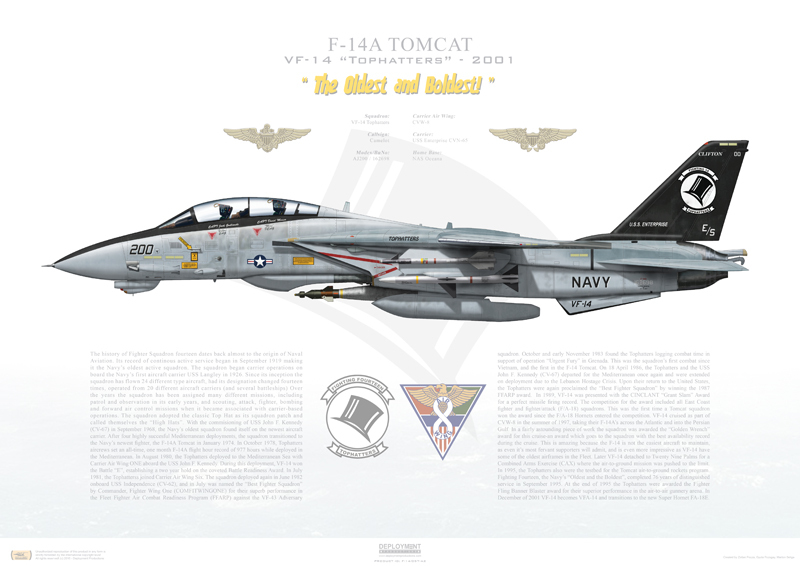 The F-14 Tomcat instead was born that day, she performed her maiden flight on Dec. 21, 1970 and served aboard U.S. Navy aircraft carriers until 2006. In the following video you can see the F-111B carrier trials attended before the aircraft was abandoned in favor of the F-14 Tomcat.